Under the guidance of Shri Swamiji a place was bought by very ardent devotees of Yogi Ram Suratkumar, the Agsar paints family in Govindapuram for this Nama Ashram. A miniature replica of Tiruvannamalai has been sculpted and an archavatara of YogiRamsuratkumar standing has been consecrated in front of the hill. Many years ago , Kanchi Maha Swamigal (Sri Chandrasekarendra Saraswathi Swamigal), conveyed his wish to see Yogi RamSuratkumar. Yogi RamSuratkumar went to Kanchi. Both of them sat in front of each other but did not talk a word to each other. After awhile Yogi Ram Suratkumar prostrated to Maha Swamigal and left Kanchi. Later on, Yogi Ram Suratkumar told our Sri Swamiji that “Acharyal asked this beggar to go to Govindapuram. But this beggar said for him Tiruvannamalai itself is enough”. This always lingered in Sri Swamiji’s mind. Maha Swamigal wished Yogi Ram Suratkumar who was constantly doing Rama Nama Japa to come to Govindapuram as Rama Nama Japa was constantly being done here. 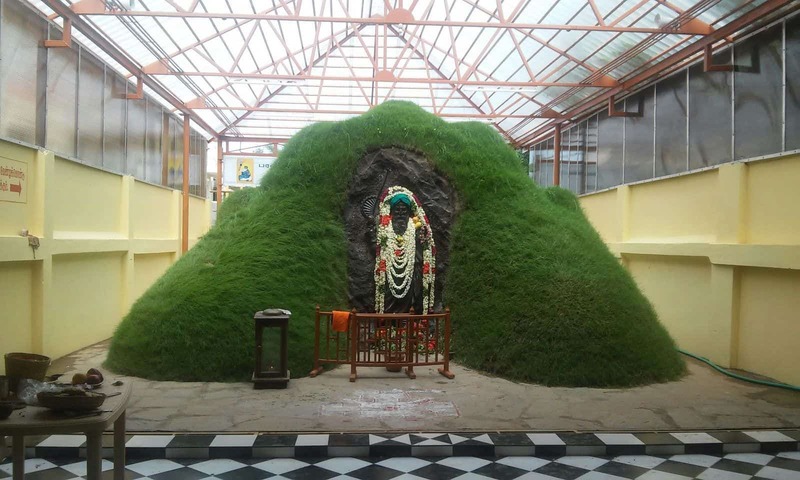 So, wanting to make Acharyal’s words come true, Sri Swamiji established this place near Bodhendral adishtanam. When construction work was progressing, an interesting fact came to be known from a very old lady in the adjacent house. She said that nearly 30-40 years ago Yogiji had actually visited that place during his wandering phase. His feet have rested in that same place when he came with the hand-fan in his hand. He has even given his hand-fan as a blessing to her before going. It is in that place that Yogiji Nama Ashram stands today. Akhanda Mahamantra kirtan and Anna dhaanam takes place here every day.